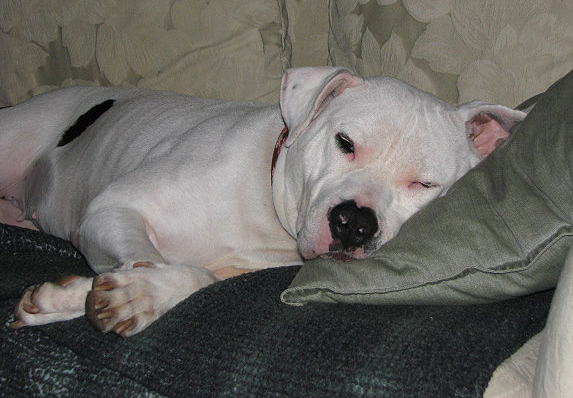 Bella’s story is sadly probably very similar to many dogs, bully breed or not. In most ways it is not nearly as sad as some of the pit bull stories that are currently in the news, like the finding of a pit bull in a garbage chute in Newark – named Patrick because he miraculously survived the night into St. Patrick’s Day. But in one important way, Bella’s story may be more sad in that it has become intensely personal to me, and her story and my story have intersected. 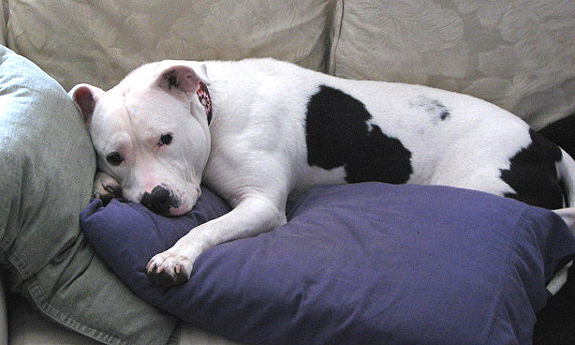 Not much is known about Bella’s life prior to the day she was found. As you can see from the pictures she was clearly malnourished, and it also looks like she was regularly physically abused – the picture demonstrates only one of a series of deep scratches and bruises noticed on her when she was found. Bella was found by a kind soul in December 2009. 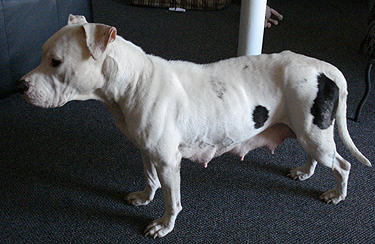 She was tied to a dumpster next to a box with her eight newborn puppies, the box covered in snow from the storm that was starting. As you would expect, the puppies were attended to and adopted in very short order. Bella was a different story. Bella was incredibly mangy, compounding an already existing skin condition. She was fed and nursed eventually back to health in a foster home. Unfortunately that home was not able to keep her, despite the bond she had developed, and surrendered her to the same shelter her puppies had been taken to. Bella remained at the shelter for the better part of a year despite being one of the staff favorites for her kind, gentle and loving nature. I can only guess this is because Bella probably did not present herself well to possible adopters. I can only assume this based on my first encounter with her when she was noticeably scared and demonstrated fear aggression. 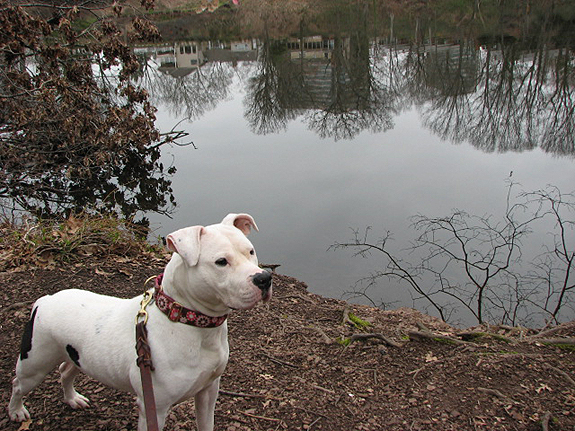 Nothing she did that day would endear herself to a possible forever home, and I imagine what I saw was similar to what others saw in her as well. Not to mention, she was already nearly 3. That combined with the bad reputation her breed has meant very few people were willing to take a chance on her. She apparently did fine in the shelter for a long period of time but after a while, she was experiencing what the shelter staff described as “shelter burnout.” They noticed she was more anxious and depressed, and it was impacting her behavior – even with the staff that she had come to know, love and trust. They sent out an e-mail alert about her and someone I know posted it on Facebook. Knowing the power of Facebook, I immediately shared it on my wall and pleaded with my friends to spread the word about Bella for someone to possibly either adopt her, or even foster her – anything to get her out of the shelter. At that point I had no interest or plans in taking this on myself. About a week later I contacted the shelter to inquire about Bella. While they noticed a slight uptick in interest, no one had made any overtures to even visit her let alone inquire about adoption/fostering. I decided I wanted to go meet Bella thinking to myself perhaps I could convince some of my animal-loving friends to go visit too. My first visit was not terribly encouraging, as I described above. Absolutely nothing about that visit should have compelled me to think any more about her – but I went back the next day. And the next. With each hour I spent with her, I saw her behavior change for the positive. She went from fearful, to ignoring me, to curious, until at some point during that third visit while I was sitting on the floor playing fetch with her, she snuck around behind me and conducted a sneak attack of kisses. I knew then that I could not have her in the shelter another day. I made arrangement with the shelter to take her on a foster basis. About a week later, Bella was dropped off at my house. It was a strange first day. I had not had a dog in a while, and the new environment intrigued Bella quite a bit. I definitely could tell she was enjoying the quiet. I could also tell that she trusted me but was not quite sure what was going on. Since that first day, Bella has been nothing but a joy to be around. Her behaviors for the most part are great. She has warmed up and enjoys meeting new people now, and while she still does not seem to like other dogs too much, she is learning to listen and calm down when others pass us at the park or the street. As you can tell from some the of the pictures of her here, she truly has learned that this is her home. In just a few short weeks she has already shown me that she is the most loyal, loving and appreciative dog I have ever owned. I understand how the breed found itself with the bad reputation it has, but I do not understand how anyone could still think them aggressive and vicious after spending any amount of time with them. Even though she is a tad older than 3 (as far as they can tell), she has the enthusiasm and playfulness of a puppy. It saddens me that her home life was probably so bad that she never got a chance to really experience being a puppy, but she seems to be making up for lost time now. The pictures do not tell the whole story, but you can definitely see how much healthier and happier she is now. And in case you were wondering – despite the fact that Bella is only a foster right now – the paperwork has already been started, and I am in the process of officially adopting her. I cannot imagine her living anywhere but here. Keep up the great work StubbyDog is doing spreading the word about this wonderful type of dog. I am doing my part to try and expose people to them and try and repair some of the damage done with false information about a beautiful dog. @skreidle Thanks for your comments, Bella is such a sweetie! Since the time I wrote this until now – Bella is officially adopted! She’s absolutely beautiful and a very lucky girl. Congratulations to both of you! @doglover thank you, Anthony and Bella are wonderful!